This is the end of my Walt Disney World First Timer Class. If you have missed the other sections, you can find them here: WDW First Timer Part 1 and here: WDW First Timer Part 2. Today we will be focusing on tips for traveling with small children. Snacks: You are welcome to take food in at the Disney parks and it’s a good idea to do so. Yes, food is available all over the place but being able to quickly provide the kids with goldfish or fruit snacks can help prevent a meltdown. Heck, I’ve even found that it’s a good idea to have some trail mix for myself. I will admit to getting ‘hangry’ at the parks when I’m in need of a blood sugar boost. Yogurt/applesauce squeeze packs: If you have a picky eater like I do, you may want to carry yogurt or applesauce squeeze packs. If we are carrying a lunchbox with an ice pack, I’ll keep them there, otherwise, the applesauce is fine at room temperature. Baby care and changing tables: Changing tables are available in almost every bathroom throughout WDW property, both women’s and men’s rooms. The parks also have baby care centers that offer large changing tables, little toilets for potty-training kids, high chairs, kitchens and nursing rooms. Baby essentials are also for sale if you run out of something. Here's a link for my full article on Disney's baby care centers. Highchairs and booster seats: They are available at all of the table service and counter service restaurants. Typically, they are the large plastic type. If you use a cover for highchairs at home, leave that out of your suitcase and just pack some clorox wipes to keep things clean. Here's a link for my full article on highchairs and boosters at WDW. Change of clothes: I have always carried a change of clothes for my kids. I pack a lightweight outfit, socks and underwear in a gallon bag and squeeze the air out of it. I almost never use it but I guess that's the case with emergency stuff. It is part of the kit I keep under the stroller. So if your kids are messy eaters or likely to want to play in the splash areas, pack accordingly. If not, take your chances and buy a new t-shirt if things get crazy. 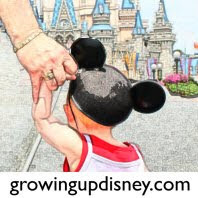 Packing: Follow these links for packing your Disney diaper bag and packing children's clothes for WDW. I have many more tips for traveling with children on our "Kiddo Tips" and "Minnie Moms" tabs. When you are finished here, be sure to read over those pages as well. Parking: Strollers will have to be parked before you enter most Walt Disney World attractions. Look for the signs designating "Stroller Parking" and leave your stroller in that area. Do not assume you can leave it somewhere just because there isn't a sign saying "no stroller parking." I have a friend who thought she could leave the stroller anywhere she liked as long as it wasn't specifically prohibited and her stroller was moved. EVERY. TIME. The Cast Members will likely move your stroller to keep things tidy but most of the time it will be in the same general area. Mark Your Stroller: Since you will have to park amid one hundred other strollers and it's likely that another one looks like yours, please do two things. First, add something brightly colored to the handle. Bandanas and ribbon work well and don't get in your way when you fold the stroller. Some folks recommend using a balloon to mark your stroller, but, and feel free to call me a grinch, I think they are generally too much trouble. We use a bright yellow wrap that is intended to go around the handle of a suitcase to help you spot it at baggage claim. I wrote our last name on it with a sharpie and it works great. The second way I want you to mark your stroller is with your last name and cell phone number. Odds are exceptionally good that you will leave WDW with your stroller but if it were to somehow get misplaced, having some contact information will increase your chances of a happy reunion. I've marked mine with my label maker however your trusty sharpie will help you out here too. Leaving Things in the Stroller: How much you leave in the stroller while you are inside depends on you. I have seen buggies totally loaded down and those nearly empty. Here's a general rule. DO NOT leave ANYTHING of value in your stroller. This is Disney World, not Utopia. Theft still happens if you give people a chance. I don't leave much in my stroller because I like to be ready for anything and sometimes you can be away from the stroller for a good length of time. If your child is near meltdown while in line and you've left the snacks in the diaper bag in the stroller, you'll really wish you had bothered to pack wisely and carry your bag around with you. I have written on the topic of diaper bags and what to carry several times over the years as the kids have grown. See the links above under "Packing." You WILL Need A Stroller: Children need strollers at Walt Disney World way after they have outgrown them at home. An older child won't need to ride as often as a small one but especially at the physically larger parks (Epcot, Animal Kingdom), you'll be happy you can push them at the end of the day instead of carrying them. We don't use a stroller for our oldest daughter on every day of the trip anymore but having at least a sit and stand stroller where she can rest occasionally is really helpful. Another bonus is that you can move at an adult pace if you are in a hurry and your child(ren) is(are) in a stroller. I've taken about 5 different strollers over the years. I'll write up my thoughts on those soon. To Fold or Not to Fold: For the most part, once you are in your park of the day, you can set up your stroller and be on your way. However, you will have to fold it for the trains at Magic Kingdom and Animal Kingdom. If you are using a Disney bus, parking lot tram or smaller boat, strollers will have to be folded before you board. The Magic Kingdom ferry and Monorail will allow you to push the stroller. My strollers require all pockets and baskets to be empty before they will fold, so I keep a little bag that folds into itself in my larger bag. I can quickly round up all the extra stuff we have accumulated before we get on the bus. Thank you for joining me for this special series. I hope you've found at least one new tip to help make your Walt Disney World vacation one full of fun and magic. I'll continue the series later, covering attractions and dining.